You can order The Demonplague, my level 1 – 20 fifth edition adventure, right now! 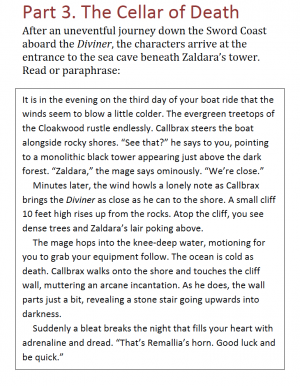 Read aloud boxed text in RPG adventures is helpful, but it also has some issues. Over the years, various adventure designers replaced boxed text with bullet points, simple opening paragraphs, and other methods. Yet it seems that at least in the world of Dungeons & Dragons, we keep coming back to boxed text because it is what many Dungeon Masters prefer. Despite that, the problems of boxed text really haven’t gone away (at least for me). I think we can do better (but I don’t know it all, and I’m hoping you’ll join me in a discussion about the strengths and weakness of boxed text in the comments of this blog post). Boxed text is great for establishing what the player characters immediately sense when they enter a new area of an adventure location. Everything the GM needs to disseminate is contained in a single, easy-to-identify place. If boxed text is left behind with nothing to replace it, then how does a GM know which details of a room to call out to the players and which details to keep hidden until further investigation (especially if the GM didn’t have a ton of time to prepare)? Boxed text is also good for conveying the tone of an adventure. The descriptive words used by the author in boxed text immediately inform the GM and players of a location’s mood and the story’s genre. Without those words, the GM is left hanging and must parse and translate the tone from other text in the adventure, imposing more work on them. While boxed text is meant to be immersive, even the shortest boxed text can momentarily break the players out of the adventure’s story. This is all because of a sudden shift in the dynamic between GM and players. The game quickly and momentarily goes from a collaborative story to a mini-lecture from the GM. This lecture mode causes many players to tune out. I’ve seen so many otherwise engaged players’ eyes glaze over when it’s boxed text time that I have to think it’s more than just bad form on their part. These players miss critical information when a game goes from collaborative to lecture then end up asking questions that lead their GMs to basically repeat what was in the boxed text. These issues surrounding boxed text are even worse if a GM has trouble reading text aloud (a problem many people including myself sometimes have). Why not just paraphrase the boxed text? For me, and for many others, this is easier said than done. Paragraphs of text aren’t easy to parse for paraphrasing, especially if you haven’t had as much time to prepare as you like (or it’s been a while since you read the boxed text). While paraphrasing is always an option, it isn’t smooth with boxed text. I also find that the longer the boxed text, the greater the need to paraphrase, but with more words in a paragraph also comes more difficulty paraphrasing. Then there is the issue of variables with boxed text. Creatures mentioned in the boxed text might be missing from an area because they went to investigate a disturbance elsewhere, or a hulking dragon isn’t mentioned so the GM gets to that after describing the cracks in the wall, or the boxed text doesn’t mention the room’s furniture was actually tossed about because the cleric cast the earthquake spell outside before entering the dungeon. The same factors that make boxed text difficult to paraphrase also make it hard to change on the fly. There’s one other issue with boxed text. It doesn’t put everything that’s in the room up front. It only mentions the things the player characters immediately notice. In some cases a hidden trap or enemy might be buried after paragraphs of descriptions and mechanics in a description. As a GM I love having all the information about each adventure area up front, and boxed text only gives me part of the picture. “Whenever the players’ characters enter a new area, the place is first described in bullet points. Bullet points written in italic type are details the characters are aware of as soon as they enter or get near the area. These bullet points can be read aloud or paraphrased. A massive pink primate that walks on four legs and has a protruding jaw stalks around the room. All manner of gym equipment is pushed off to the sides of the room in piles. Broken targeting robots, sparring weapons, weights, and other athletic supplies are covered in dust. If the cultists have not left to investigate a disturbance elsewhere, add: Three robed Kith’uks clean their laser rifles with brutal efficiency, seemingly comfortable with the giant pink monster walking around them. I am no expert, and I’m just one dude with a blog and an opinion. Boxed text has been around longer than I have! If you feel motivated, please chat with me in the comments and let me know what you think of boxed text and of the Burn Bryte playtest approach to descriptive text. Thank you for reading, and double thanks if you comment. I’ve got a new DMs Guild product! It’s an adventure for level 20 characters… and it has more than fifty tarrasques! (You read that correctly.) Behold the product description of Invasion from the Planet of Tarrasques! Invasion from the Planet of Tarrasques is a single-session, over-the-top, gonzo action adventure meant for four to six level 20 characters. The adventure serves as a capstone for Waterdeep: Dragon Heist and Waterdeep: Dungeon of the Mad Mage, but can be modified for any setting. What’s more fun than one tarrasque? How about multiple tarrasques stomping across Waterdeep? How about a whole planet full of tarrasques ready to rumble? 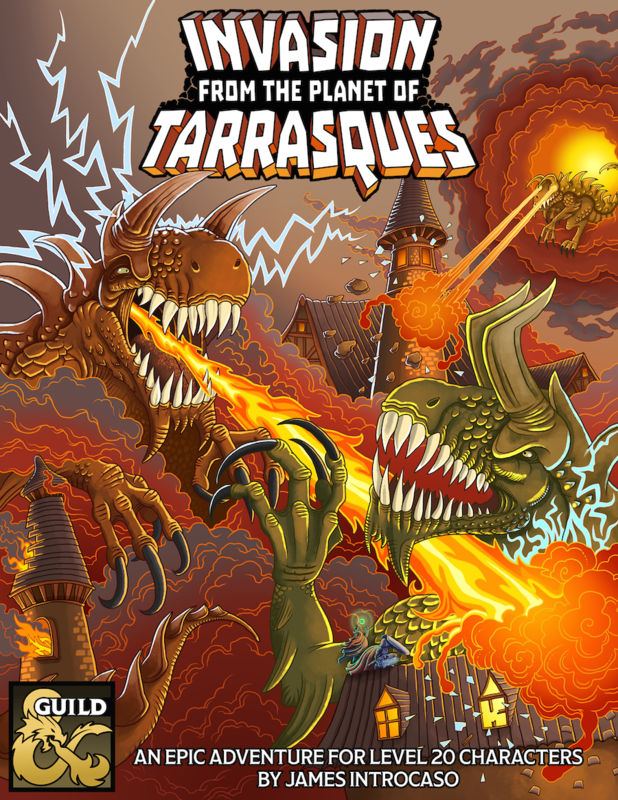 If that sounds exciting, then Invasion from the Planet of Tarrasques is for you. Halaster Blackcloak, the Mad Mage of Undermountain, always has a contingency in place. As long as Undermountain remains beneath the city of Waterdeep, Halaster can never truly die within its walls, for the dungeon rebuilds the mage’s body on the rare occasions when adventurers “kill” Halaster. Halaster realized that if adventurers destroyed all of Undermountain (a nigh impossible feat more difficult than even slaying the mage), he would lose his immortality. To further protect his life, Halaster took some of the rooms and halls of Undermountain and flung them across the multiverse, including other worlds of the Material Plane. With Undermountain spread across existence, the task of permanently killing Halaster is even more difficult. Unfortunately for the mage, a party adventurers recently killed him in his dungeon beneath the City of Splendors. When Halaster’s body reformed, he found himself in Falx, another world of the Material Plane inhabited entirely by enormous, carnivorous monsters with endless appetites. These scaly bipeds are closely related to the tarrasque, an infamous monstrosity feared across the worlds of the Material Plane. Halaster, now obsessed with punishing the adventurers who killed him, began to hatch a plot. If one tarrasque could level an entire city, what could a planet’s worth of the beings do to Faerûn? This adventure is divided into three chapters. Chapter 1. In “Giff You a Hand” a platoon of giff arrive in a spacefaring vessel and warn the adventurers about a coming invasion of tarrasques. With the clock ticking, the characters have a chance to prepare for the battle by mustering their allies. Chapter 2. In “Battle for Waterdeep” the characters face-off with the invading titans, defend Waterdeep, and fight for their lives. Chapter 3. In “Falx, Ho!” the characters travel through a portal to the planet of Falx to face Halaster and his army of tarrasques atop a stone tower made from pieces of Undermountain. I commissioned Stacey Allan to make the cover art, which is my favorite for ANY DMs Guild product (though I am biased). Ain’t it rad? It’s time to announce another DMs Guild Adepts product that I worked on! This time it’s for the release of Mordenkainen’s Tome of Foes. 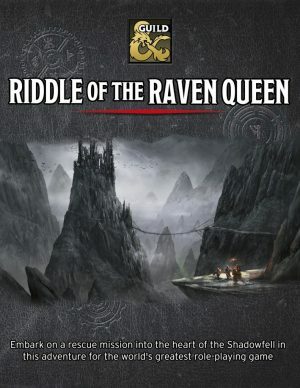 The adventure is called Riddle of the Raven Queen. This 8-12-hour adventure for 5th to 10th level characters takes heroes from the elf village Dripping Leaves in Cormanthyr Forest to a drow outpost to the Shadowfell. Along the way they contend with new creatures and story elements found in Mordenkainen’s Tome of Foes. 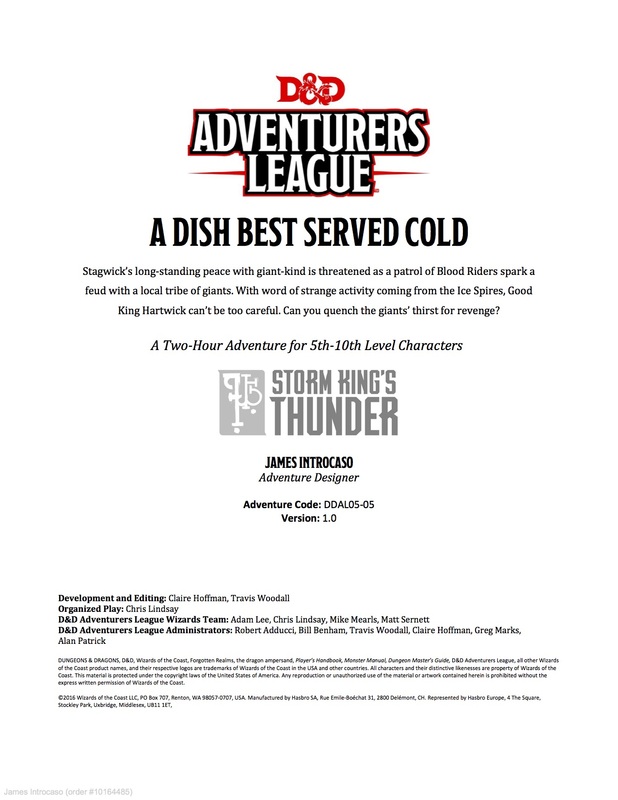 This product is written in the D&D Adventurers League style and features nine monsters from Mordenkainen’s Tome of Foes and their stat blocks plus one original monster and one original magic item. I wrote the adventure with Claire Hoffman, Greg Marks, and Travis Woodall. Ginny Loveday edited our tome and Rich Lescouflair did the amazing layout and production. It’s already a Copper Best Seller and has four five-star reviews, so give it a gander! The denizens of the Old City have made some unusual sightings in the festering refuse pits on the outskirts of the city, and while such reports are seldom taken terribly seriously, the mysterious disappearance of a beloved figure in the poor part of Port Nyanzaru has folks on edge. Can you get to the bottom of this? Part One of The Rot from Within Trilogy. This two-hour adventure represents many hours of work on my end and countless hours from others. The Adventurers League Admins are incredible at what they do and the adventure would not be where it is without the amazing feedback from playtesters. 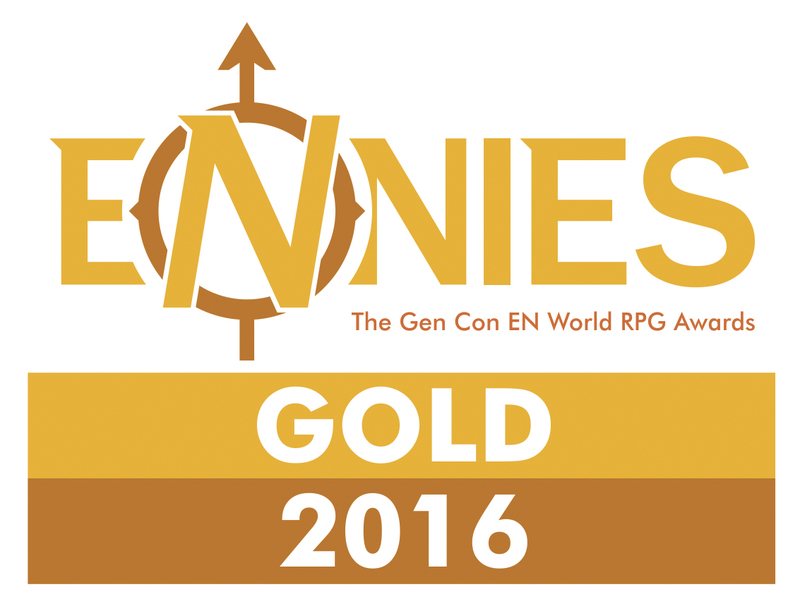 It’s already a Silver best seller on the guild and the proud owner of one five-star review! If you like the adventure, I recommend you buy Travis Woodall‘s Deluxe Digital Map Pack for the adventure, Lysa Chen‘s Part Two of the trilogy, and Cindy Moore‘s Part Three of the trilogy! A quick note to let you know that one of my podcasts, Have Spellbook, Will Travel, just launched a Patreon. If you love the show and want to support it with cash, check it out. If you love the show and don’t want to support it with cash, consider shouting it out on social media! Thanks! Do you like zombies? Do you like dinosaurs? How about dinosaur zombies? Well, I’ve got them for you in spades! Last week, the first Guild Adepts products appeared on the DMs Guild. I authored material in three of the products! I’m going to tell you all about them, but first a recap. What is the DMs Guild Adepts program? Over the next few months, we’re going to highlight the creative activities of a select few game designers on the Dungeon Masters Guild through the Guild Adept program. We have chosen 10 extremely talented individuals and, not unlike lion robot vehicles, formed them into a singular formidable entity of creative D&D development. We’ve given them early access to the upcoming adventure from D&D, Tomb of Annihilation, and have challenged them to create kickass adventures and rules options to accompany the launch of that product. I’m one of those ten people! We’ve put out and will continue to create through October new products on the DMs Guild for Tomb of Annihilation. Here’s what I’ve helped create so far. 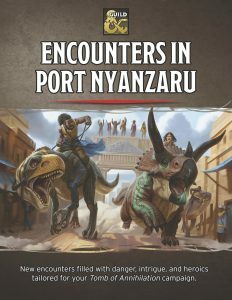 Encounters in Port Nyanzaru has the work of nine Guild Adepts and features 13 new encounters in Port Nyanzaru, the only city in Chult. 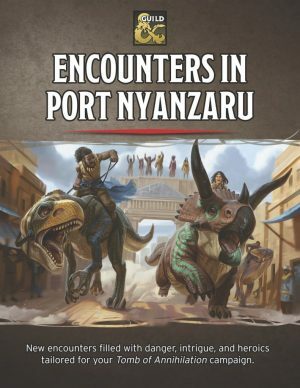 The encounters can be added to any Tomb of Annihilation campaign. Combat, danger, intrigue, and pulp are all yours in this exciting supplement. It should be noted that in addition to the amazing encounter he wrote, Rich Lescouflair also did the layout and cartography for this product. He rocks! Beast of the Jungle Rot is a collaboration between Ruty Rutenberg and myself. No Tomb of Annihilation campaign is complete without this collection of more thunder lizards… and more zombie thunder lizards! Behold new dinosaurs, including the legendary giganotosaurus and titanosaurus, and new zombie dinosaurs with terrifying and unique necrotic abilities! 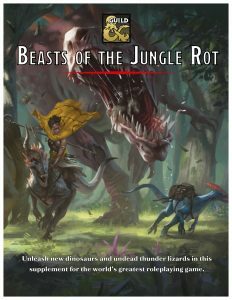 Plus expanded rules for random encounters, dinosaur races, and hunting dinosaurs for hides and eggs. A full list of dinosaurs can be found on the product page. If you like these dinos, you should check out Will Doyle’s Ruins of Mezro. It has a few of them featured, plus a lot of other awesome! In Cellar of Death something evil is devouring the souls of the living in Chult, but before the characters take on the horrors in Tomb of Annihilation, they must first uncover the death curse’s origin by braving a lich’s tower in the Cloakwood. 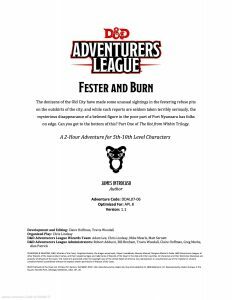 This introductory adventure is designed for a party of four to six 1st-level characters, who should advance to 2nd level by the adventurer’s conclusion. It is a prelude to Tomb of Annihilation that should take about 2 to 3 hours. 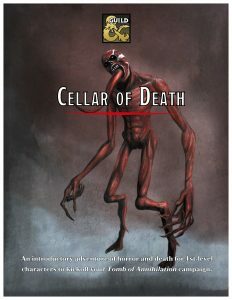 What inspired Cellar of Death? The introduction of Tomb of Annihilation states Syndra Silvane learned about the Soulmonger from the Harpers, who “received their intelligence from a lich.” This adventure is the story of how the Harpers gathered that information. Cellar of Death has a second purpose: to give characters a greater stake in the outcome of Tomb of Annihilation by creating an NPC they love. The death curse kills this NPC, giving the characters a personal reason to go to Chult. James Introcaso chats with M.T. Black, Cindy Moore, Merric Blackman, and Richard Jansen-Parkes about writing and running one-shot D&D adventures. James Introcaso talks writing adventures on the DMs Guild with best-selling game designers Tony Petrecca, M.T. Black, and Jeff C. Stevens. Stagwick’s long-standing peace with giant-kind is threatened as a patrol of Blood Riders spark a feud with a local tribe of giants. With word of strange activity coming from the Ice Spires, Good King Hartwick can’t be too careful. Can you quench the giants’ thirst for revenge? This two-hour adventure represents many hours of work on my end and countless hours from others. 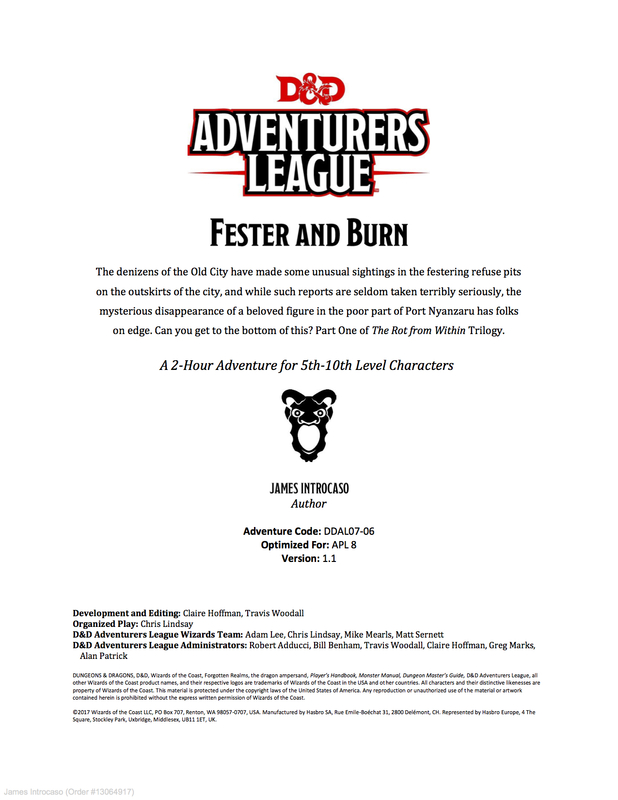 The Adventurers League Admins are incredible at what they do and the adventure would not be where it is without the amazing feedback from playtesters. Speaking of playtesting, an encounter was removed from the adventure for time during the playtesting feedback phase. These adventures need to fit to time for conventions and game stores, but if you’re playing it at home and want to throw another encounter into the mix, here’s how! And while you’re at it, pick up Travis Woodall’s awesome Deluxe Digital Map Pack for the adventure! Terrain. Eight-inch deep snow covers the ground. Medium and smaller creatures who move more than half their speed must succeed on a DC 13 Dexterity saving throw or fall prone at the end of their turn, suffering the debris-covered ground. Climate and Weather. Snow falls rapidly from the sky, whipping around in all directions as the wind howls. Wisdom (Perception) checks that involve vision or hearing and ranged attacks against targets more than 30 feet away are made at disadvantage. The abominable yeti that Scövja and Burleigh were hunting is hiding in this area. The smell of the bodies signaled an easy meal to the creature. More corpses were once on the ground here, but the yeti ate those. A successful DC 15 Wisdom (Survival) check determines there were once more corpses in the snow. The monster hid by the tent when it heard the characters approaching, lying down to look like an enormous snowdrift. A successful Wisdom (Perception) check against the yeti’s Dexterity (Stealth) check spots the creature. If a character approaches within 40 feet of the yeti, the monster stands and attacks. The yeti fights until it is reduced to 30 hit points, then flees. Here are recommendations for adjusting this combat encounter. These are not cumulative. If you buy the adventure, let me know what you think. Leave a rating on the DMs Guild and please help spread the word if you enjoy it! That’s it for this week. This post was months in the making! I sit down with Allison Rossi, Neal Powell, and Round Table newbie Michael Robbins to discuss the latest Curse of Strahd previews – the Haunted One background and the Death House adventure. This podcast was recorded on February 28, 2016. Please rate and review The Tome Show on iTunes! It helps us so much and only takes 30 seconds!